School started this week which means that there are actually a few hours a day where the house is QUIET. I took full advantage and jumped right into yeast bread baking. There’s this coffee house that I visit with a coworker when we just need a change of scenery and they are fab-o for a whole bunch of reasons. 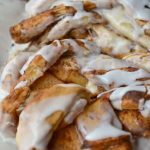 But their giant cinnamon rolls top the list. Whenever we go work there we share one, and then buy them all and take them home to loved ones because they are So. Dang. Good. I have some cinnamon roll game of my own and have shared it with you before. It hasn’t been that long since we made Croque Monsieur Rolls. Remember those? YEAHHH. Also very popular are my Blackberry Sticky Buns. And here’s my secret: The only things I change here are the frostings and the fillings. The dough is PERFECT. It’s soft and sturdy at the same time. 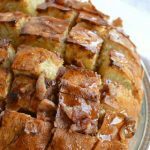 It can hold up to ham and cheese or blackberries or insane amounts of brown sugar and butter. So I knew this dough would also be perfect for GIANT Cinnamon Rolls. 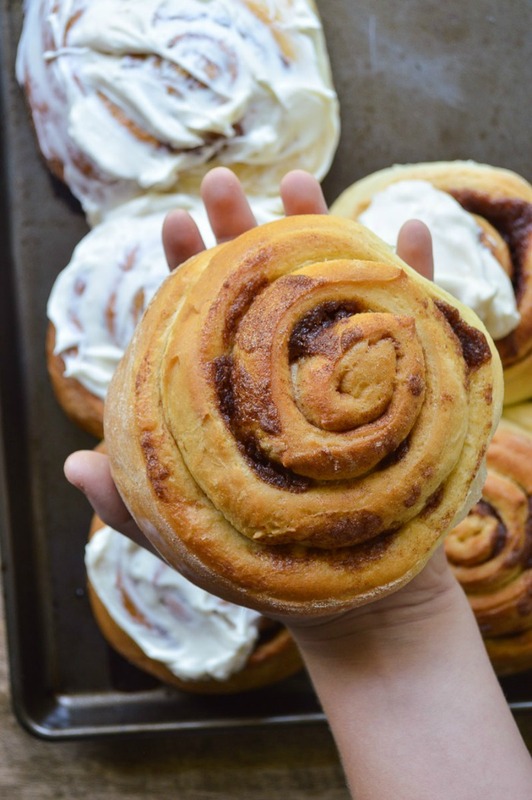 You can totally use this exact same recipe to make normal sized cinnamon rolls. Even the bake time remains the same. The difference is the WAY YOU ROLL. 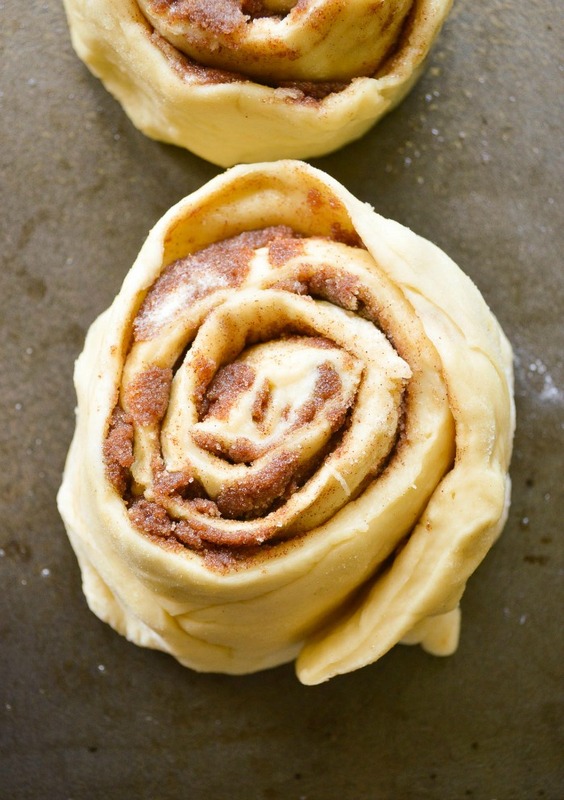 So for standard cinnamon rolls (or sticky buns or whatever), after the initial rise when you roll out the dough, you are going to make a rectangle, fill it, and roll the long side away from you. For giant cinnamon rolls, you are going to make a rectangle with the SHORT SIDE closest to you. Fill it, and then roll it away. 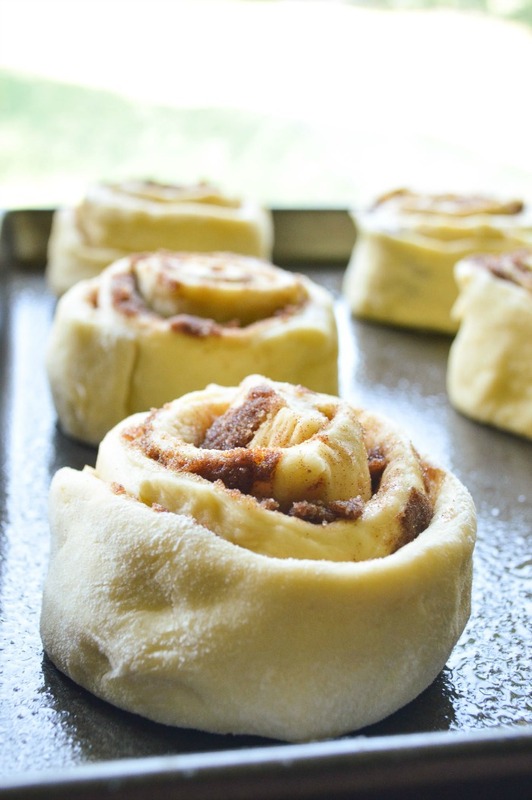 You’ll have a short, fat roll of filled dough that you will then cut into just 6 pieces. 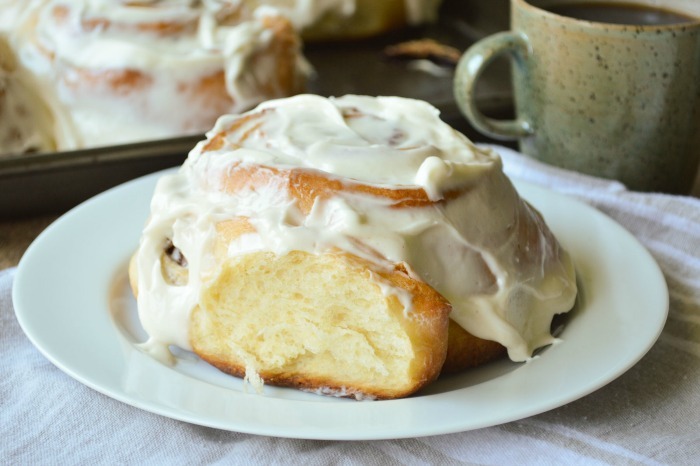 These Giant Cinnamon Rolls are no freaking joke. 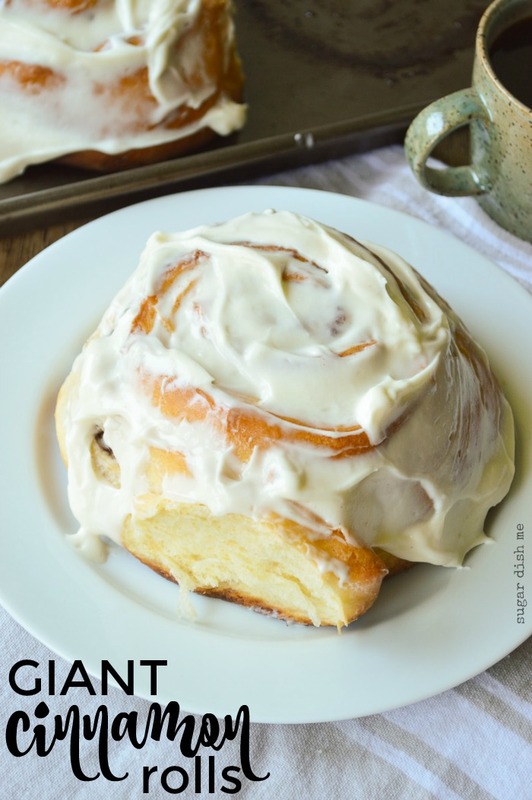 The frosting has one little thing that’s different from other breakfast bun type frostings I have made in the past and that’s the addition of almond extract. That’s a tip straight from the coffee shop lady. Don’t skip it. If you are curious about the addition of corn syrup, know that it gives your frosting a perfect hint of shine and adds some extra spreadability. Sweet and pretty is how I like my frosting. Light corn syrup will get you there. If you love coffee house favorites, you should also check out this Cranberry Orange Scones Recipe. YASSSSSSS QUEEN. I think I might make these one weekend soon! I can always go for a cinnamon roll. I have these proofing right now! So far so good. ???? Hey Brie! YESSSSSS. Hope you loved them! 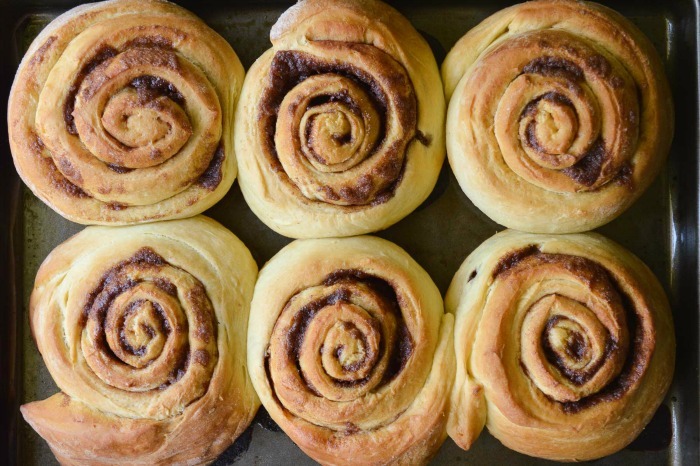 Can you refrigerate these and bake the next morning? You can try it! I haven’t tested the recipe that way but it does work well with other similar cinnamon roll dough. If it works be sure to let us know! I am in the last step now, waiting to put into the oven to bake…. I decided to make a caramel sauce to put into the bottome of the baking dish &then put chopped almonds on top of that before putting the chut rolls in the pan to proof. When they are done I am planning on flipping the pan over onto a cookie sheet 🙂 fingers crossed! Also I didnt realize I was out of milk so I used vanilla coffe creamer. The dough tasted good! super great! turned out fabulous. could have done without the almond ex. I wasn’t a fan of that taste. but truly everything came out perfect and delicious. Since it is cream cheese icing do you have to refrigerate left overs? Soooo excited I found this recipe today!! 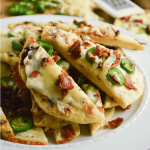 Making them today for a dinner date my hubby and I have with friends this evening! Thanks Heather! Thank you, Rachel! I hope you enjoy! This is one of my favorites. Made these yesterday and they are fabulous! I am making a stacked cake with cinnamon rolls so I wanted to see if these would be firm enough if I did giant springform pan rolls and they came out wonderfully. Total baking time was 30 without foil and then I covered with foil for additional 10 minutes due to the fact that I they were really wedged into a 9″ springform. I will be making 4 pans and stacking into a tired cake. Icing with the corn syrup turned out smooth and shiny and tasty, thank you! OMG HOLLY! I hope you will come back with photos of this cake! A link to your Instagram or something? I am very excited to see your creation. Would this work in bread machine to start dough? I have never used a bread machine! So I really have no idea. If you try it, and it works, please let us know! Thanks, Gail! 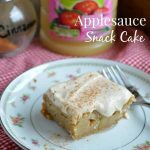 I found this recipe last year. I’ve been obsessed with the perfect cinnamon roll. And I finally found it ! These are perfect ! I even made some extra , stored them in the freezer and when microwaved it was like they were just baked ! I never bookmarked the page and have spent so much waisted time this whole past year trying every recipe all over again to find this one. I can’t tell you how excited I was to have stumbled on it again. And I look forward to trying many more of your recipes. I’m confident they will be just as perfect !! Thank you so much for the perfect cinnamon roll !! Thank you so much, Dani! I love that you were able to freeze these! These were awesome! I did use bread machine to make the dough (as my house isn’t warm enough for dough to rise properly), turned out great! thank you.